Below is the list of averages for the 2019 JJVA SPI Las Vegas Tournament can be found by clicking HERE. 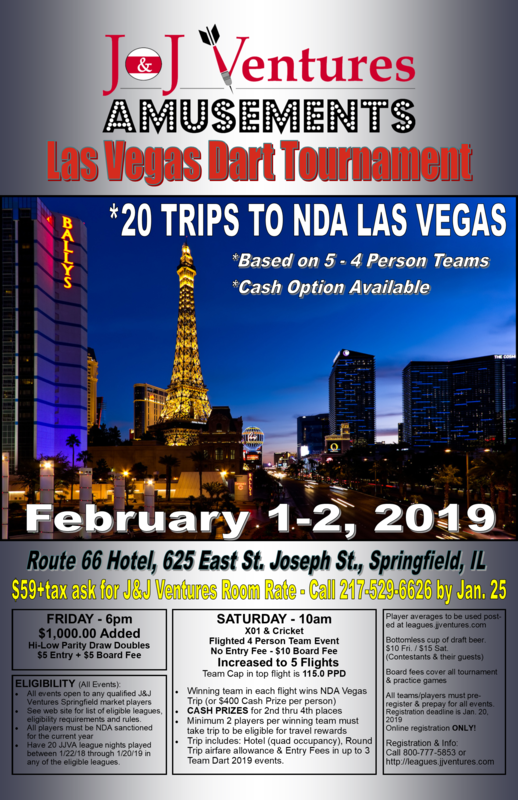 Averages are compiled from: Darts TOC 2018 standings, JJVA leagues, JJVA PRP Finale, JJVA All League Challenge & JJVA SPI Vegas Tournament. Qualifying league games and matches are not listed here. It is the players responsibility to ensure that they have the required number of league games or matches by the deadline dates for the event. Being listed here does not indicate that the player has met the specific event eligibility requirements. If a player's name is listed more than once, the highest average can be used or the player may contact their league office so that the stats can be merged and recalculated. For the purposes of brevity some players in our database have been removed from this list due to what we perceived as insufficient match count for eligibility. Also, not included are players with less than 24 qualifying ’01 games in our stats files for the period. Double In, Double Out, Split Bull or 13” league games are also not included in the stats but if needed any games or league nights played under these formats would count toward the 20 league match requirements. The rules state that all players on a team must have at least 20 league matches between 1/22/2018 and 1/20/19. Additional player eligibility rules for either of this events is posted on their respective pages on this site. League play in the qualifying period may come from league competition in participating J&J Ventures Amusements leagues. It is possible that some game counts from new markets are not included in this list and thus further research may be needed to verify eligibility. If your name is not listed and you feel you may be eligible for this event then contact your league director so that we can research your stats and provide an appropriate average as well as check on your total game or match count. Additionally many players will be listed that are ineligible as they have not completed the necessary matches in eligible leagues in the SPI market. Most remote leagues are not eligible toward this program or event.